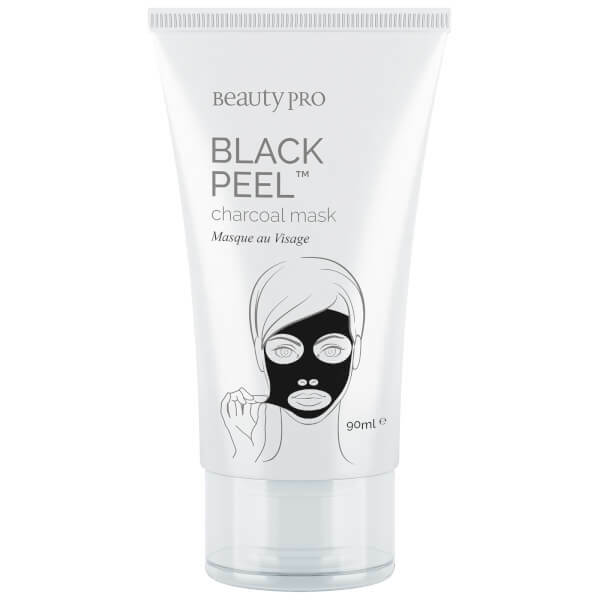 Reveal refreshed and purified skin with the BeautyPro Black Peel Charcoal Mask, a detoxifying spot treatment that restores balance to the complexion. Formulated with Active Charcoal to melt away bacteria and impurities from deep within pores, the face mask uses a hydrating blend of Deep Sea Water and Tea Tree to sweep away excess oil and maintain a healthy moisture balance. The treatment works to firm and tone the facial contours while boosting elasticity and brightening the complexion for a youthful-looking effect. After use, skin feels calm and comfortable and appears visibly healthy. Free from mineral oil, lanolin, petroleum and parabens. Not tested on animals. Apply to cleansed, dry skin using clean finger tips or a mask brush, avoiding the hairline, eye and lip area. Remove after 20 minutes or when fully dry and elastic. Gently peel away mask in an upward motion. Rinse with warm water. Aqua, Alcohol Denat., Polyvinyl Alcohol, PEG-60 Hydrogenated Castor Oil, Glycerin, Cellulose Gum, Charcoal Powder, Phenoxyethanol, Chlorphenesin, Fragrance, Ethylhexylglycerin, Sodium Magnesium Silicate, Algin, Trehalose, Caprylyl Glycol, Polyglycerin-10, Polyglyceryl-10 Stearate, Polyglyceryl-10 Myristate, Disodium EDTA, Citric Acid, Sodium Dehydroacetate, Vitis Vinifera (Grape) Fruit extract, Butylene Glycol, Sea Water, Lavandula Angustifolia (Lavender) Flower Water, Fragaria Chiloensis (Strawberry) Fruit Extract, Ginkgo Biloba Leaf Extract, Citrus Aurantium Dulcis (Orange) Fruit Water, Camellia Sinensis Leaf Extract, Melaleuca Alternifolia (Tea Tree) Leaf Oil, Citrus Limon (Lemon) Fruit Extract, Sodium Benzoate, Potassium Sorbate, Parfum.